As one might have noticed, I am an aficionado of German artist John Heartfield’s photomontages and the impact it has had on popular and underground cultures, e.g. Sakevi from G.I.S.M. Aleksandr Zhitomirsky is the soviet equivalent to John Heartfield, whose propaganda and photomontages tackled German troops during World War II. After World War II and confined behind the iron curtain, Zhitomirsky enjoyed a career as a writer for Pravda and other publications, which he used as a vantage point to not only criticize and vilify mainly the politics and politicians from the new world, from Truman through to Ronald Reagan in the 1980s but also educate his audiences about what was out of reach for them to experience first-hand. This tome is an encompassing, abundantly opulently illustrated account of political artist Zhitomirsky’s thought-provoking and at times hilarious emissions, which were inspired by his friend John Heartfield, and whose epinomous and classic work of image manipulation has to this date largely remained in the shadows as it was even sidelined in the USSR. 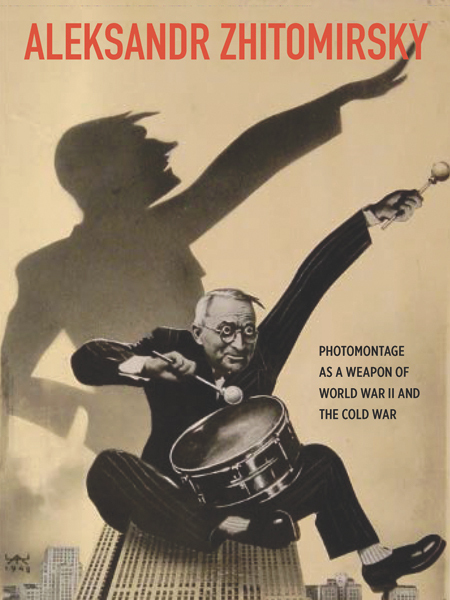 Apart from the focus on Zhitomirsky, Photomontage as a Weapon of World War II and the Cold War is an homage to the power of visual propaganda combined with political messaging and an essential source for those interested in investigating the circumstances and limitations in which he had to operate.